Another PGA Show has come and gone! It's always one of our favorite weeks to connect with many of our partners across the industry and share our new technology solutions. 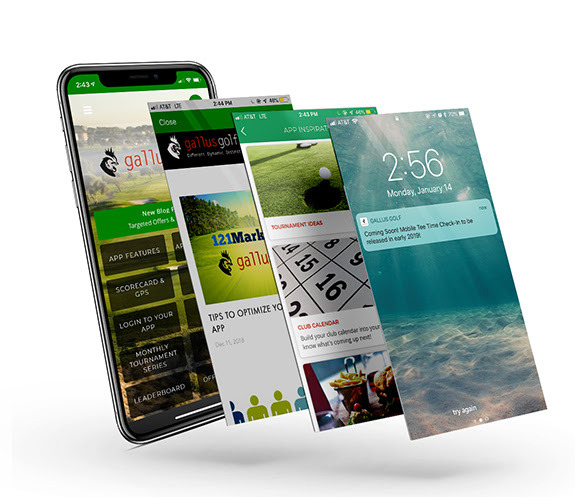 Leading up to the show we were excited to announce our Gallus Golf Club app, upcoming 2019 integrations, and mobile app check-in! For those of you who were not able to attend, be sure to check our recap of the show and learn what’s in store for 2019! Leading into the Day One of the show, we announced that we have released the Gallus Golf Club app. When you download the app, you will have early access to product specials, integration news, and marketing tips. This is also a very helpful resource if you want the best practices on utilizing your club app! Download the Gallus Golf Club app today! Speaking of integrations, we have lots to share with you about what’s to come for 2019. One new integration feature unveiled at the 2019 PGA Show is our Mobile App Check-In. This new feature will allow golfers to self check-in and pay for their green fee right from the course’s mobile app. As golfers check in a day or more before and pay, abandoned tee times will become a thing of the past. This will also create a more dynamic golf shop experience when the golfer arrives at the course. Golf shop staff will now be able to relieve some of their focus on check-in and replace it with more meaningful conversations with customers. The initial rollout of this feature will be available with foreUP, Club Prophet Systems, and Chronogolf for the 2019 season. Our integrations don’t stop here. Learn what else we have planned for 2019 with our Gallus Marketplace. Our “Innovation First” Approach for 2019 was kicked off with the release of the Gallus Marketplace, a one-stop shop featuring integrations and partnerships with many best-in-class providers. These integrations, set to be released throughout 2019, will help courses communicate with their customers in a revenue-driven manner. Featured in the Gallus Marketplace is a list of partners ranging from Tee Sheet Providers, Tournament Softwares, Website and Technology Solutions. With these new connections to data, clubs will be able to enhance the customer experience in a variety of ways. Through our partnership with Cognistix, courses will be able to leverage AI to drive revenue to any operation of their facility. Cognistix is an Artificial Intelligence developer and using their machine learning technology the two will be able to send automated offers and messages to the individual golfer. Improving the tournament experience is another big initiative for Gallus. Listed on the Gallus Marketplace for 2019 integrations are Vision Perfect, Golf Genius, and Golf League Tracker. These integrations will expand on the tournament and league needs of course operators, while also connecting seamlessly to their branded course app for an interactive golf experience. Available in early 2019, our partnered clubs will have access to Players 1st customer feedback tools. Players 1st is the leading provider in golfer satisfaction feedback. Their platform designed to help your club retain and recruit players. For more details on current and upcoming integrations, please visit https://gallusgolf.com/marketplace. Women’s Golf Day held a panel discussion this year to educate industry professionals on their global movement to grow women’s presence in golf. Women’s Golf Day will be June 4th, 2019 and is a four-hour event that takes place around the world at registered locations. Since it's start in 2016, over 900 locations in 52 countries have participated. The panel included a range of industry leaders including Troon Executive Kris Strauss, PLAY for P.I.N.K., and PGA Professionals among others. All speakers provided their perspective on how this inclusive initiative has helped their facilities expand their women's consumer base. Available now until February 28th, 2019 is FREE REGISTRATION for your facility to be an official location of Women’s Golf Day for June 4th, 2019. This offer, which normally in years past was $79, includes WGD Marketing Materials, Profile Page on the WGD website, and event reviews. To learn more on Women’s Golf Day and their limited time offer, please visit https://womensgolfday.com/. Thank you to all who were able to visit us at the Show. 2019 is set to be our most innovative year yet, and we can’t wait to share the new solutions that will be released this year! 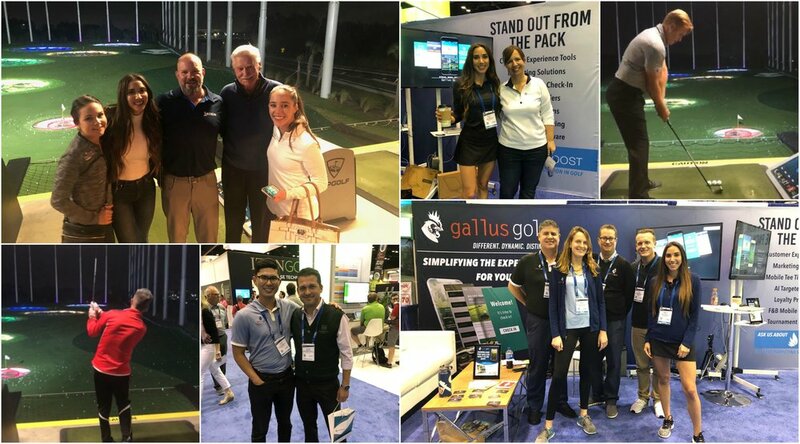 If you were not able to attend the show but would like to learn more about Gallus Golf integrations and solutions, please contact support@gallusgolf.com.